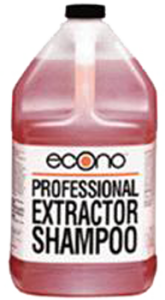 Econo Extractor Shampoo is a professional strength shampoo designed for commercial use. It is formulated with biodegradable surfactants for proper wetting and cleaning. Sequestering agents are part of the formula to aid the cleaning and drying process. Finally, optical brighteners are added to enhance the fabric color, leaving a “like new” appearance. 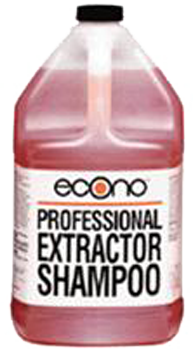 Econo Extractor Shampoo is safe on natural and synthetic fibers when used as directed. 1. Vacuum carpet and pre-spot heavily solid areas and traffic patterns with Castle® Spotlifter™ . 2. Dilute Echo Extractor Shampoo 1 quart concentrate to 5 gallons of water. 3. Run wand or nozzle over area being cleaned jetting solution as needed. Pick up spent solution and soil by running back and forth several times, over lapping previously cleaned area slightly. 4. Finish carpet with nap brush.